In his new book, Christian Zillner analyzes the parallelism of the east european art situation with the western art scene. In his approach he had chosen one person from the east side of Europe, the hungarian artist László László Révész. In the beginning the author and protagonist of the book walk together in a park getting into a conversation. Starting from this walk and from this conversation, Zillner goes beyond history and art history in order to express and explain the story behind. 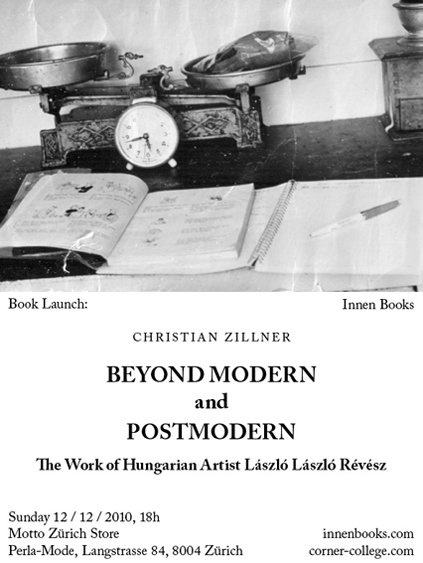 This is the premier of the first edition of Christian Zillner’s Beyond Modern and Postmodern, the work of Hungarian artist László László Révész. The book was originally written in german, in 2009-2010, and was translated by Darin Kranick in the summer of 2010. The book contains fifteen reproductions of Révész’s works. for the launch of the book at Motto Zürich, the author and the artist portrayed in the book will be present and will hold a short conversation about the topic. A book signing is organized, as well as a screening of ‘little smoke’, a video from Révész. this work is a single channel video work, made in 2010, reflecting on ‘short vision’, a film made for the ‘campaign for nuclear disarmament’ in 1956 by Peter and Joan Foldes. twelve drawings from the artist will be hanged.